This bundle includes (1) XD221U-ST(D) 3D-Ready DLP Projector and (1) eBeam Edge. At last, a multimedia projector that goes right to the front of the class. 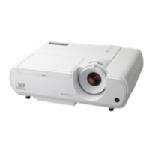 The XD221U-ST DLP 3D-ready projector takes classroom presentations to a new level, with ultra short-throw capabilities, sharp image reproduction, incredibly quiet operation, low cost of operation and more. With the XD221U-ST multimedia projector instructors no longer worry about casting a shadow on the whiteboard or face the bright glare of the projector. An ultra-powerful short-throw lens can project an amazing 60-inch diagonal image from a distance of just 33-inch, an asset whether the room is large or small. Near-silent 26 decibel operation in low mode ensures that the XD221 doesn't compete with the presenter. A high-volume, 10 watt built-in speaker eliminates the need for an external speaker. The optional microphone reproduces the presenter's voice loud and clear in real-time while the audio mix feature enables the microphone's audio to lay over the sound from another input source.